Do you want to stop kids’ whining now? It is one of a parent’s biggest challenges. 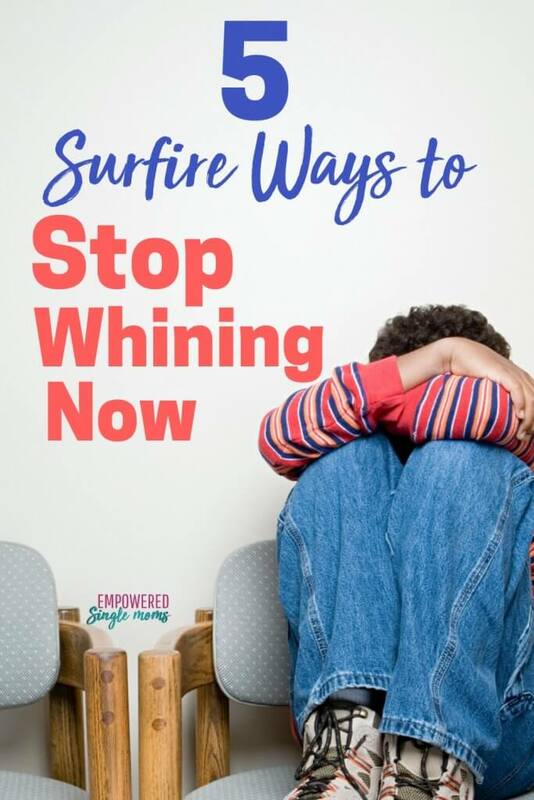 I remember the night I discovered the key to stopping whining. I was exhausted from my day at work and trying to get dinner on the table. That time between getting home and sitting down for dinner is sometimes referred to as the arsenic hour, and when you are a single parent, that hour is even more challenging because you can’t tag-team the situation. My son had a severe case of the whiny-crabbies. I was ready to scream. The more he whined and complained, the more I felt on edge. It was as if I was being forced to endure an endless playlist of fingernails scratching chalkboards. I was holding on to my temper by a thread. Truth be told, my temper had escaped a time or two. It had not reached the level of a rabid dog yet, but it was not pretty. Finally, I had the presence of mind to ask him what was wrong. He yelled, “I am stressed out because you are stressed out! If you weren’t so stressed out, I wouldn’t be stressed out!” It was like a light switch flipped on. That statement forever changed the arsenic hour. Moms set the emotional tone for the home. Have you ever noticed when you are having a rough day, your kids are more needy or crabby? When you are in your happy place, it is more likely that the kids are also in a happy place. That is because kids are very sensitive to our emotional state. My son was aware that my stress was affecting him, but often kids are not that aware why they are feeling on edge. The recovery community uses the acronym H.A.L.T. (Hungry, Angry, Lonely, Tired) to remind recovering addicts what can trigger a relapse. It is also a good reminder for what may be contributing to our feelings of stress and our kids’ crabbiness. Once we know why we are on edge emotionally, it is much easier to solve the problem. H is for hunger. When we are hungry, we have a biological response to low blood sugar. We become irritable, anxious, sad, or all three. You can read more about how to avoid low blood sugar here. However, if it is almost dinner time you want to avoid a filling snack that would ruin the children’s or your appetite for dinner. I find it helpful to offer a first course of fruit or vegetables while I am preparing dinner. It is easy to share a bowl of berries, cut-up apples, or a container of clean, cut-up raw vegetables while dinner is being prepared, and you will likely find that everyone is happier with a snack. 3. Did You Have a Bad Day? A is for anger. Sometimes, we have difficulties during school or work. When that happens, often mom or the kids will take out their frustration from the day on each other. When your children are in a surly mood, ask them about their day. Maybe they got picked last for a team during gym or recess or they feel stupid because they did not understand their math lesson. Perhaps something unpleasant happened and they need to talk about it and get some assistance with solving their problem. L is for lonely. When we are lonely, we feel sad; when we feel sad, sometimes it comes out as anger. If you or your child are lonely, it is easy to be short-tempered. Maybe your child misses the other parent and a call to check in will ease the loneliness, or maybe they had a fight with their best friend. Whatever triggered the loneliness, a little extra cuddle time after dinner or doing something fun as a family can help immensely. If you are the one feeling lonely, maybe you need to schedule some friend time for yourself. T stands for tired. I remember the exhaustion of being up late with a newborn or sick children. It is hard to be happy when you are tired. Not getting enough sleep makes us more vulnerable to anxiety, depression, and physical illness. It also gives us less self-control and increases irritability. Can someone step in for a few hours so you can take a much-needed nap? Think about the steps can you take to get to bed earlier and get more restful sleep. Are your children getting the recommended amount of sleep for their ages? 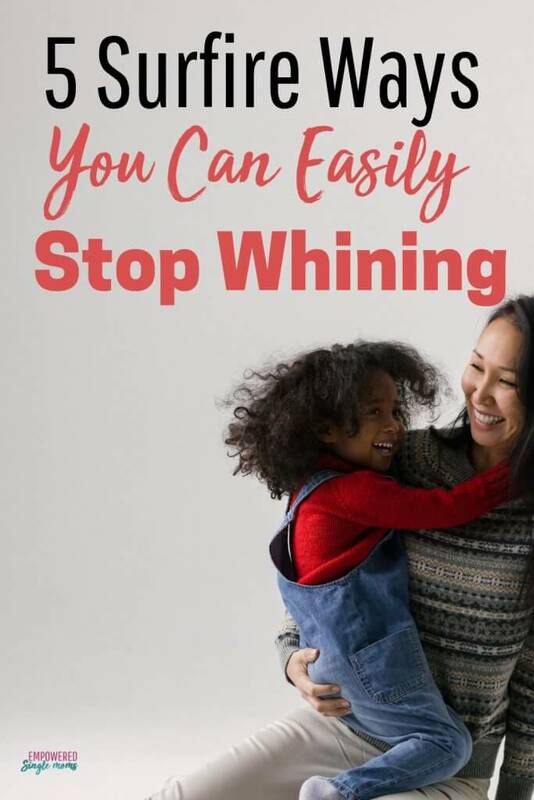 Stopping whining may be as simple as getting them to bed a bit earlier. To cut down on whining, focus on keeping yourself in a calm mental state. Then, check to see if your child has a need in one of the five H.A.L.T. areas (Hungry, Angry, Lonely, Tired) and solve that problem. H. A.L.T. will help you remember triggers for conflicts. Better yet, set up systems to minimize the possibilities that the children will be hungry or tired and teach them skills to deal with loneliness and anger. You too can avoid the pitfalls of the arsenic hour. I made a special Facebook group just for you. It is a place to talk with other single moms and get support when you need it. You can join here.